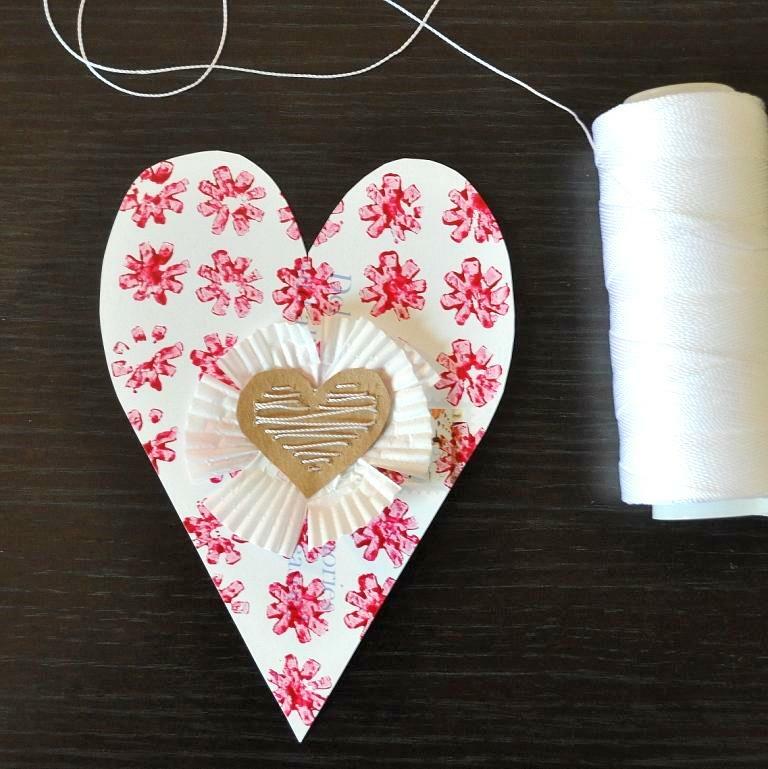 for my mid-winter (aka valentines) crafts, I decided to borrow some textile related ideas and translate them to my favorite medium, paper. 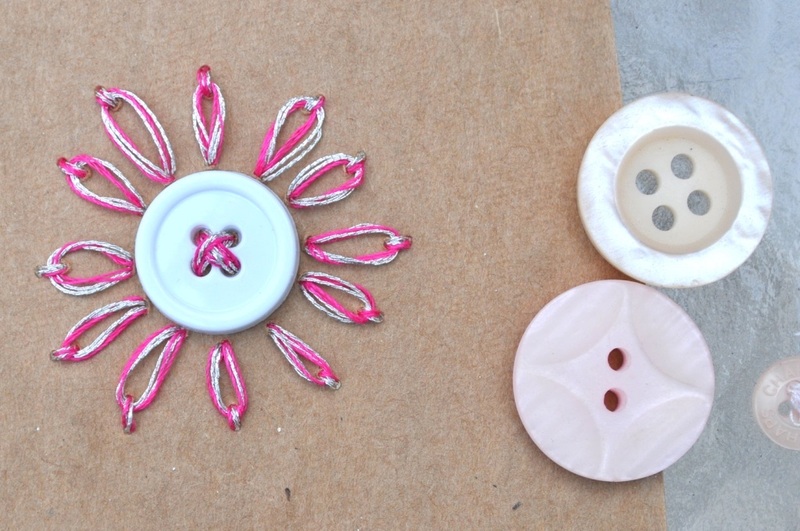 It adds a touch of novelty to paper craftiness by incorporating hand stitching. 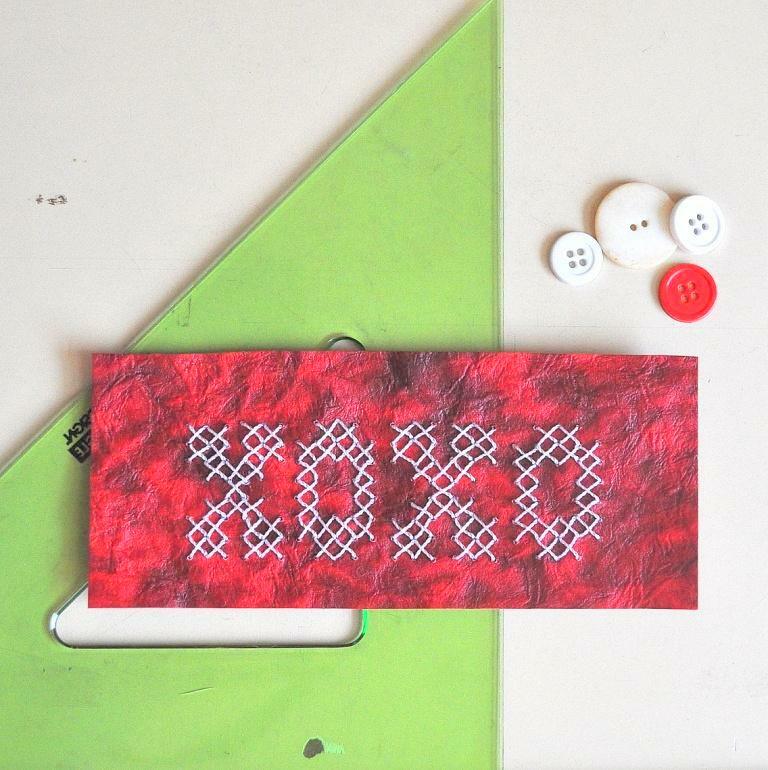 Plus there’s something sweetly nostalgic about a hand made valentine. The items pictured here are not finished valentines. They are pieces that will later become part of a finished valentine. For my very first paper stitching project, I cut a small square from a brown paper bag, selected a button and threaded my hand needle. No up front prep work. 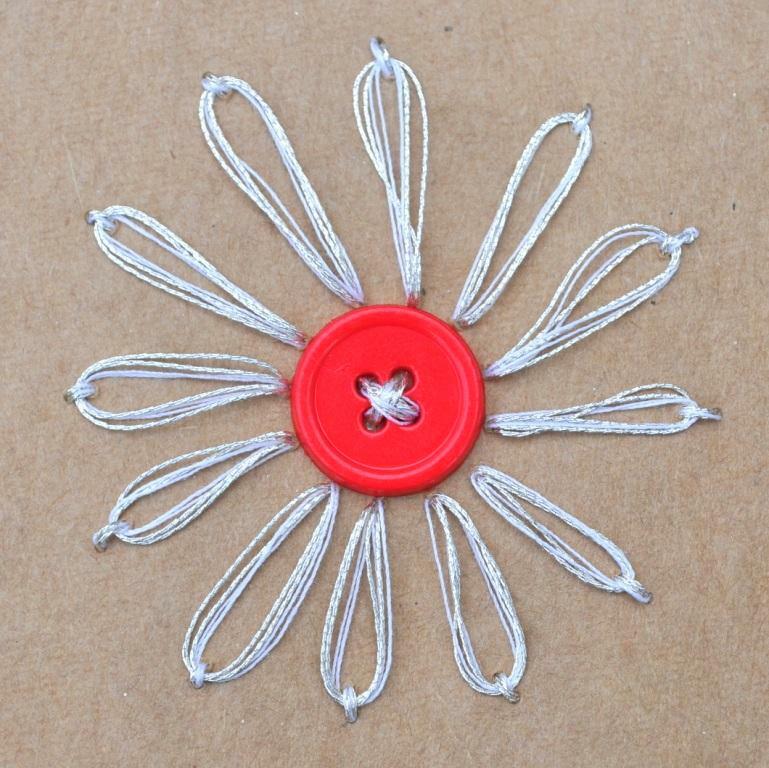 The basic loop stitch makes a pretty flower. However, I hadn’t yet learned the technique of perforating the paper in advance. And my second attempt was a fail that I managed to (sort of) rescue. After that I decided to trace my designs to the back side of the paper and make perforations before stitching. 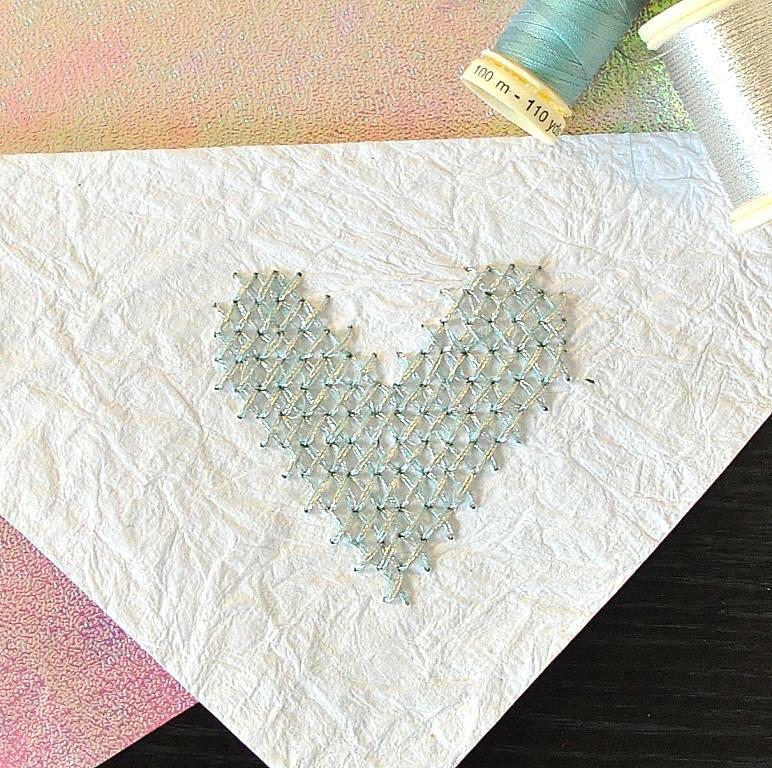 I like the look of this satin stiched heart, but I should have made long stitches both top and bottom. My shortcut approach makes the stitching lopsided, but I still like it. Cross stitching is only slightly more complex. Draw a grid and pencil in the stitches on the reverse side of the paper, then perforate at each needle point before beginning. Both pieces are stitched on thick hand-made paper scraps that I purchased in a bundle from an art supply store. It is a beginning. I’m experimenting with paper and ribbon ruffles next. And I so enjoy reading about your process of creation. It’s fascinating. You’ve got me all jazzed for Valentines Day! Have a beautiful Sunday, dear friend! Loved these ideas. You are so creative! I just lurrrrrve all your creative ideas. You are a huuuuge clever-clogs!!! These are so pretty. And so many uses…. Gorgeous! Someone’s in for a very special Valentine! I love the buttons and the cross stitching! I’ll bet no one throws your Valentine’s away! Lovely idea, lovely pictures. I put your creation on my pinterest board! These are so creative! I love that you used buttons. I just tried stitching paper too but with a machine!